Wes Ellis: Shane's been "tagged"
Hey if you're a fan of Shane Claiborne and his book, then you should really check out the Another World is Possible DVD series. 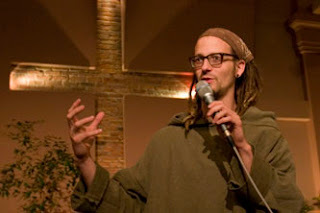 It's a multimedia project by Shane Claiborne and Jamie Moffett (co-founders of the Simple Way) that emerged in response to their belief that things are not right in the world, and that they don't have to stay that way. There are three DVD's, one on war, one on poverty, and one on creation. You can find out more about them at www.awip.us.